This is part of an occasional series mining the mundane to find the sacred. For a list of the posts in the series, head here. If I never had to do housework again, that really would be fine by me. But I like our dishes and clothes to be clean; a tidy house is restful for my brain; and we don’t (yet) have kids old enough to do all our work for us (does that ever happen?). So turning my mind to how to make cleaning easier and quicker (rather than more thorough or glamorous or enjoyable, necessarily) is a spiritual practice for me. How can I build a life where I do the things I ought to do, and as efficiently and painlessly as possible, so I have time for the things I am more interested in? 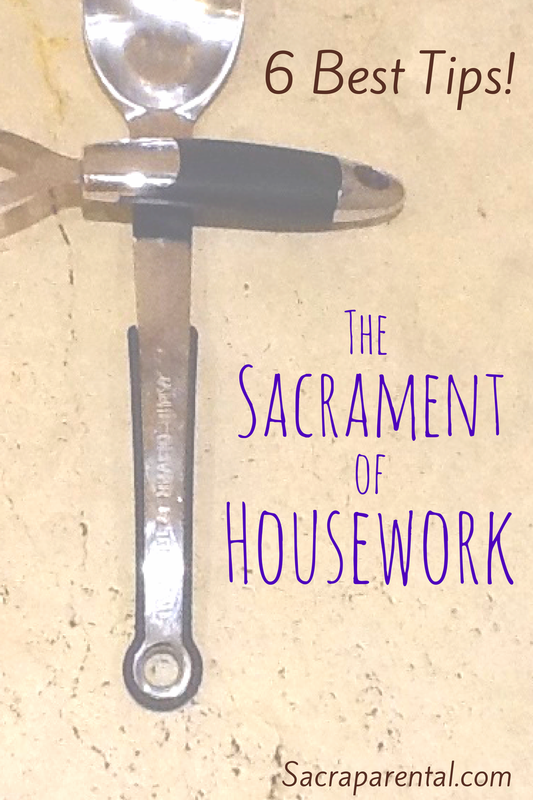 For more on why I think ‘housework’ and ‘sacrament’ go well in a sentence together (and for all my disclaimers about how these posts aren’t springing from any expertise!) head back to the previous post (still one of the most popular on Sacraparental), My 11 Best Stolen Home Organisation Tips. But now, onto the tips: mine and, hopefully, yours. Clean up in the evening. Even if it breaks tradition. My husband and I both come from families that are pretty relaxed about when the dishes get done – after dinner is fine, or maybe sometime before bed, or maybe we’ll just do them in the morning, eh? After living with the super-tidy Lois, I have decided that her clean-as-you-go approach is a better one for us (though I don’t think I’ve converted my husband to this belief yet. Maybe I should send him to live with Lois for a while?). It is a restful thing to wake up to a tidy(ish) house. And it makes hosting morning visitors, expected or otherwise, much less stressful. Really, really not, at the moment, but it’s still a great idea! If you keep sets of cleaning materials where they are regularly needed, you can do five minutes’ cleaning when you have five minutes, without having to summon the energy and focus to assemble things. So I keep bathroom cleaning things in the bathroom and take two minutes to clean the basin or base-boards when I have a moment. This is particularly good when my toddler is in the bath and keen for company. You can keep a cleaning cloth in the car and dust the dashboard when you’re waiting to pick someone up. Keep the vacuum cleaner somewhere handy to the main living area so there’s no barrier to doing a quick three-minute swish when you’re feeling motivated. Slowly – oh, so slowly! – but surely, I am greenifying my cleaning supplies. My approach is to make one change at a time, swapping one potion for a more ‘natural’ alternative until that feels normal and routine, then add another. Otherwise it’s all too daunting. But over the last five or so years, little by little, I’ve got to the stage where I have stopped buying most commercial cleaning products. It saves heaps of money and reduces the range and (extraordinarily high) number of chemicals I come into contact with each day and week. Good for health (probably) and good for the environment (definitely). So far I regularly use baking soda, white vinegar, soapnuts, tea-tree oil and lemon juice but haven’t ventured into the world of borax and washing soda, which is probably all you need to do all household cleaning without commercial chemicals. I have a spray bottle of straight white vinegar (it’s a strong anti-bacterial) in the bathroom and use it about two-thirds of the time, alternating with an (‘eco-friendly’) commercial spray for cleaning in there, either ‘just to be sure’ or because of modernist superstition, who knows :). I have another bottle of it in the kitchen and use it as a multi-purpose spot cleaner and direct onto the floor or furniture whenever there are toilet-learning misses. In the kitchen, though, I mostly just clean surfaces with hot water and elbow grease, which apparently is all that’s needed for most cleaning, in terms of getting rid of nastiness. We use white vinegar to mop the floors, just diluted with boiling water. It also does the job of rinse aid in the dishwasher, and descales shower heads and appliances. And I clean out drains in the kitchen and bathroom by shaking down baking soda and the pouring vinegar over to fizz and agitate the gunk off. Oh, and it’s worth mentioning that the smell of vinegar disappears after a few minutes. So don’t be put off by thinking your house is going to smell like chips. You can make a paste of baking soda and the juice of a lemon, to the consistency of a commercial cream cleaner like Jif. Now that I’ve tried this, I’ll never use anything else to scrub the bath and tiles (when I actually do). That lemon juice and baking soda paste is also great to use around the base of the toilet, to absorb odours and get the place really clean. You can smear it all around into any crevices, leave it for a bit, spray it with white vinegar (so it bubbles and gets into every space), then wipe off the excess and leave the rest there for a few weeks to absorb odours and stop urine from splashing where you can’t clean it up easily. We have an old bathroom with lots of tiny gaps in the floorboards and around the fixtures, so I leave the paste there, a bit like grouting or caulking, and only need to repeat the process every couple of months. In between I clean normally, and make the most of the paste being there by cleaning with white vinegar much of the time. With a smoother, newer bathroom, you could do a short version of this every week or three and just clean it all off. Vacuuming the house can be a big, daunting job. From our past days of hardly any carpet, we have a light stick vacuum cleaner. It’s not very strong, and we now have a more powerful one too, but the light one lives in the lounge on a charger and is handy for doing a one-minute vacuum whenever you notice it’s needed. It’s not specifically a cleaning tip, but as I said on Angela’s recent excellent post on housework (which you should definitely check out), I find listening to podcasts makes all cleaning tasks better. If I put one on to do the dishes to, but it’s still going when I’m done, I then want to find other jobs to do while I listen to the rest – probably the only time in the world when I look for more cleaning to do. Also the only time I clean the microwave. I’d love your recommendations if you’re a podcast listener – pop them in the comments below. On the last post in this series, My 11 Best Stolen Home Organisation Tips, the comments were filled with heaps of great ideas. So please do the same on this one, friends. What are your best tips for making housework easier and faster? Do you use ‘green’ cleaning stuff? What are your favourite podcasts? What doesn’t work for you? Please comment below with all your ideas, however tidy or messy your house happens to be right now. All help welcome and gratefully received! This is the fifth post in a series on recategorising housework as a sacramental activity – somewhere God can be keenly experienced. The first post pairs a Joy Cowley Psalm with a piece from the book of Proverbs; the second is about the power of doing someone else’s housework; the third challenges the view that Jesus was dismissive of housework when he visited Mary and Martha; and the fourth is full of practical tips for organising a house. See the whole series list here. There are plenty of ways to join the conversation and keep in the loop. You can get emails whenever there’s a new post here by signing up at the top of the right-hand sidebar, and/or also follow me on Facebook (for extra links and resources, daily), Pinterest (for link-plantations including this board on green cleaning) and Twitter (for bursts of ranting and raving). Totes, boxes, containers for everything! I will admit to having a storage container obsession, particularly the pretty floral ones…but they are terribly useful for sorting and containing just about anything. Shoes, clothes, toys, books, craft materials, school supplies, food…the difficult part is persuading the rest of my family to use them. But I find it makes cleaning up easier, and in theory makes finding things easier too. Okay, looking around my house right now, I’m in no position to offer advice, but here goes anyway! If you are someone like me who hates the monotony of cleaning when the kids are about to mess it all up again, my tip is to get them involved. Kids can do so much more than you think. My 3 year old has to have all his toys and his room tidy before he’s allowed any screen time. This is very motivating for him and consequently his room is usually the tidiest in the house! We also have a rule that he has to put whatever he’s playing with away before he gets anything else out. This worked well when he was younger, but now his play is more elaborate and includes more pieces and precious creations it doesn’t really work – I’d be keen to know what others do for this! He has set jobs: taking his dishes to the kitchen, wiping the table, putting his pyjamas under his pillow, night nappy in the rubbish and dirty clothes in the laundry basket. He also helps to set the table and empties the cutlery from the dishwasher. He is responsible for keeping his toys tidy too. He also used to vacuum with the mini vac under the table after every meal, our mini vac has just died, but I’m keen to get another and reinstate this. With all this, I’m hoping to raise a child who is naturally more tidy than I am! This is all really helpful, thanks, Frank! I am engaging a lot in ‘motivational’ bargains with SBJ at the moment (making my peace with bribery… at least bribing with things I’ll already be giving him!) so this is a good one to file away! Don’t put it down, put it away. Or maybe get rid of it! Ha, but surely you don’t really think I can convert your husband…I have enough trouble with my own in the clean(ing) department! I HATE sorting clean washing. It weighed on me all the time so I made a plan. I now sort washing on a Monday morning first thing. I save it all up through the week in blue IKEA bags and then first thing Monday morning I listen to a murder mystery podcast and sort it all. I no longer worry about it the rest of the time because I have a plan and I actually enjoy the time because I spend it listening to something I have specifically saved for that morning. So my tip is make a habit not a decision! Also with older kids for a while we had cleaning hour – once a week everyone joined in with cleaning and tidying – while listening to something lively like ABBA – and we got lots done – but we haven’t managed to stick to that now kids are older and off working etc. at strange hours. And finally I think inviting people over for dinner works well as you just have to at least clean the kitchen and dining room! I hate housework and am not good at it but those things have helped me sometimes – still in more chaos than I like! I was just talking to a friend today about the ‘invite people over’ strategy which works well for me too! Ok, first and foremost: why would the house smelling like chips be a problem?! I so agree about keeping cleaning stuff where you use it, and knowing how long a task takes (loo and basin clean = 6 mins). Since I grew up with aforementioned super-lois, I too love an orderly house. I’m still trying to decide how to balance my need with my three year’s need to SPREAD CRAP EVERYWHERE / build himself a chicken coop / space rocket / boat in the hallway (which basically involves carrying all his toys in there, all the sofa pillows, and freaking out if the crawler knocks the “door” (couch pillow) down). Interesting to read your reflections Frank, and others. Thanks. Some brilliant, hilarious housework advice from Erma Bombeck here.